So, you watched the big game at your neighbor’s house, who just so happened to have bought a brand-new flat screen. The colors, response time and majesty of the television has you itching to up your viewing game as well, but you’re not sure where to start. 4K, high-res, LED, smart TVs, HDR…all the television tech terms can be overwhelming. What are the important things to consider when shopping for a new television? We have great news; it is not that complicated. The first thing you need to determine is what size television you need and want. Determining the size of television that makes sense in your room doesn’t have to be a guessing game. In fact, there is a simple formula to help you figure it out. Start by measuring the distance from your favorite seat to the wall (in inches). Then divide by 3 and boom: you have the recommended size of television that will fit best in your room. We are not saying that 4K is the latest and greatest, but what we are saying is that 4K technology is becoming the standard across all brands and price ranges. If you are investing in a new television, at the bare minimum make sure it is 4K. 4K for Beginners: 4K televisions offer a clearer picture than standard 1080p HD televisions, meaning better picture quality, definition and clarity. 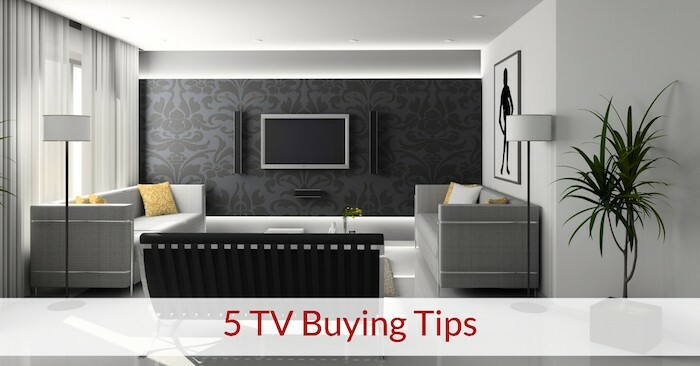 You’re starting in the right place with researching online about the features to look for and consider when buying a TV, but don’t let an anonymous online review alone sell you on a television. We strongly suggest speaking with a home theater pro to help you understand what features benefit your space and needs the best. You might find that some of the features you thought you’d love aren’t for you. That’s you! What are you planning to use the television for? Gaming? Sports? Binging Game of Thrones? Will your television be in a dark room or a bright room with a lot of natural light? These are important things to consider since not all televisions are created equally or for the same purpose. If you’re unsure where the answers to these questions leads you in terms of television set, we can help you sort that out. That’s exactly what we do. February is an insanely good month to purchase a television for two factors. First, the deep discounts for those big-game shoppers but possibly more influential is that the new TVs typically hit market in March or April. This means amazing deals on last year’s models. Ready to buy? Please let us know if you need some help!